Gee whiz is an old-fashioned Americanism, what is known as a minced oath. We tend to be more explicit in our swearing these days, but here is a link to an entertaining list of minced oaths. The reason why I share this dreadfully important insight will (I hope) become clear shortly. My mother was not much of a cook, bless her heart. I recall only two dishes that she made, when we were growing up, that were “fancy”. One was a cheddar and crab meat dip that was kept warm in a chafing dish; the only time the chafing dish ever appeared. This hors d’ouvre was reserved for adult, New Year’s Eve-type cocktail parties. We could each have a taste before being sent off to child land and if we were lucky there might be some residue to scrape out in the morning. It was gooey, good and very rich. The other dish, which was made for us, was also cheesy and rich. Welsh rarebit. OMG, we loved it! It too was a special occasion food; that is, when we had Welsh ‘rabbit’, as we called it, supper became a special occasion. Oh my, we licked those plates clean. On a rare (oh, dear) family trip to Williamsburg, Virginia, we were thrilled to have rarebit in the colonial tavern. It was heady, cheesy stuff. It may actually have been a little ‘heady’ for us kids, since it is traditionally made with ale. While he was researching Salt Sugar Fat: How the Food Giants Hooked Us, Michael Moss interviewed hundreds of people ‘who have been closely associated with advancing or critiquing the activities of the processed food industry.‘ (pp. 353) One man, Al Clausi, was responsible (with his team) for the development of two of the most iconic processed foods of the 1950’s: Tang and Jello Instant Pudding. (pp. 47-59) These are great stories, in a great book. All I can say is gee whiz. This entry was posted in PPFIC and tagged 1950's, chafing dish, Cheez Whiz, Gee whiz, list of minced oaths, Michael Moss, NaBloPoMo, Tang, Welsh rarebit by Assembling a Cooking Life. Bookmark the permalink. Memories are stirred with your mention of Cheese Whiz… which leads to Marshmallow Fluff… and yes, Joyce, Miracle Whip… I don’t think we ever had real mayo in the house, just MW slathered triple-thick with olive loaf bologna on white-bread sandwiches. Must say I am astounded at parental hoodwinking that convinced us that melted cheez whiz over toast was such a ‘special’ treat, along with the gourmet touch of adding chopped hot dogs to cardboard-packaged mac ‘n’ cheese on rare magical occasions. Will just mention that I have our family’s old glass salad bowl that used to serve five of us at dinner. I can barely get two persons’ worth of today’s salad size into it! Easy to laugh (and sort of gag) looking back at those days and dinners, but parents didn’t really know better back then, did they? I am so sorry my comments about Velveeta Cheese were not saved, due to my 1950’s skills with technology! 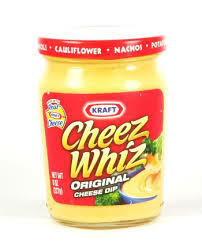 I must say I was an afficionado of Velveeta and looked down my nose at the kids who ate Cheez Whiz. It was definitely “less than”, like Miracle Whip!